The Great British Bake Off is back on which makes me very happy, and this year I wanted to do something I didn’t get round to last year – join in the Great Bloggers’ Bake Off run by Jenny at Mummy Mishaps. The idea is to bake something inspired by the challenges on that week’s show, whether copying a recipe done or coming up with something yourself. This week was Swiss rolls, Mary Berry’s cherry cake and miniature British classics. As soon as I saw some of the contestants making coloured patterned Swiss rolls, I knew that’s what I wanted to try! And what Minion fan wouldn’t love to eat these?!? Absolutely amazing, but I didn’t want to be overly ambitious as each separate colour you use adds to the preparation time (and my piping skills leave a lot to be desired!). You do the pattern first, one colour at at time, either freezing the batter, or cooking it for a very short time, to set it in place and stop it bleeding into the rest of the roll. You then pour the rest of the batter over the top and cook the whole sponge. Patterned Swiss roll decided, but what about the flavour? I wanted to do something a bit different. 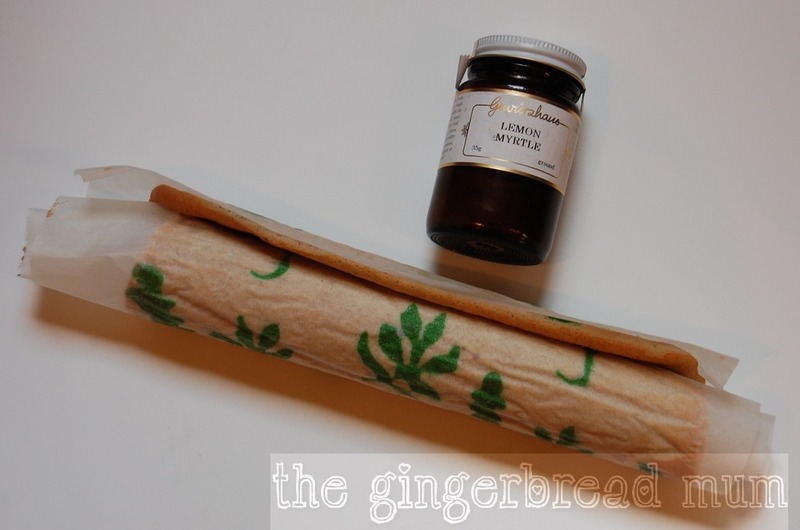 When I saw my lovely blogger friend Blue’s creation inspired by her childhood memory of an Aussie honey roll with the twist of lavender, I remembered the Australian herbs and spices my wonderful hubby brought back from a work trip to Melbourne. Powdered lemon myrtle was the first one I pulled out and my decision was made. You can learn more about lemon myrtle here and I’ve found it to buy in the UK here. It has the most amazingly strong lemon aroma and you really get the sense of it being a wild bush plant when you taste it in something. However, you can substitute it with lemongrass powder or lemon verbena for a similar more earthy lemon flavour. I used my husband’s Swiss roll recipe converting his very easy to remember ‘3-3-3’ formula (3 dessert spoons of plain flour, 3 dessert spoons of sugar and 3 eggs) to grams. His Swiss rolls always turn out wonderfully light using just the whisked egg whites to make it fluffy; unfortunately mine didn’t. Whisking the egg whites a bit to make the batter for the pattern, waiting for that to freeze and then whisking the whites again to fold into the main batter didn’t work that well (and hubby wasn’t impressed!). 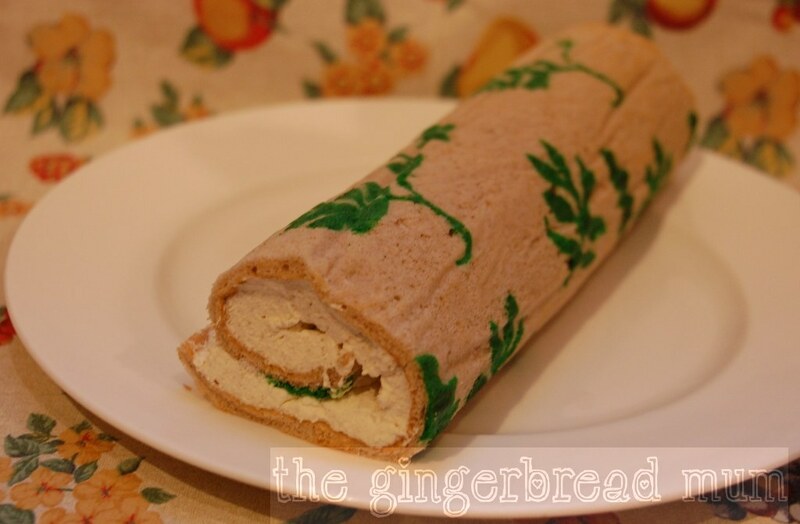 Next time I do a patterned Swiss roll I’ll use self-raising flour to produce a more stable batter. Separate the eggs putting the yolks into a medium-sized mixing bowl and the whites into a bowl big enough to beat them (a metal one is supposedly better for beating egg whites). Add the 50g of caster sugar to the egg yolks and beat by hand with a whisk until it’s turned a paler colour. Keep beating and add the flour a spoonful at a time and then the lemon myrtle. Put 2 tablespoons of the egg and flour mix in a small bowl and add a very small amount of food colouring gel to get your required shade. Using an electric beater, whisk the eggs whites until soft peaks have just started to form. Add 2 tablespoons of the whisked egg whites to the sponge batter you put in the smaller bowl and mix together (you don’t need to worry about the whites collapsing). Keep adding egg white until you have a fairly runny mixture similar to the consistency of single cream. Put in a small clean resealable bag and squeeze the mixture to a bottom corner. Snip the corner off (it needs to be very small!) 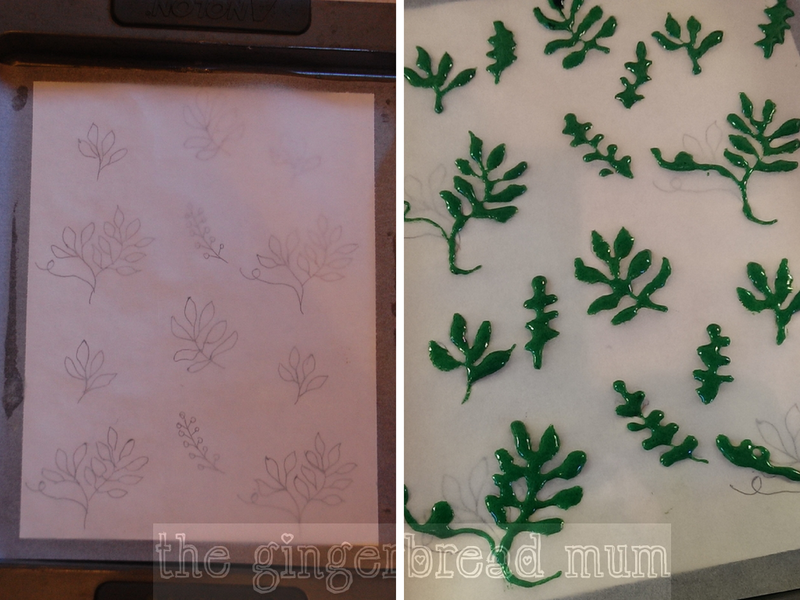 and pipe your design onto your prepared tray using your pattern as a guide. Put your tray into the freezer for 15 minutes. Preheat your oven to 175C. Just before you take your tray out of the freezer, whip your remaining egg whites a little bit more until you just have firm peaks. Add about a third of the egg whites to the remaining sponge batter and thoroughly mix. Take your tray out of the freezer. Gently fold the rest of the egg whites into the sponge batter and pour the batter into your tray using a spatula to very gently cover your design without smudging it. Bake for 8-10 minutes until lightly golden brown. Keeping the sponge on the baking paper, roll it up tightly while it’s still warm and leave to cool. To make the cream filling, whip the double cream, lemon myrtle and sugar until stiff. When the sponge has cooled, gently unwrap it and peel off the baking paper. Trim the sides and spread the cream over the sponge (putting slightly more at the end you’ll start rolling it up and slightly less at the other). Roll up the sponge as tightly as you can and trim the end just before you finish rolling. Chill in the fridge to firm up for at least an hour. 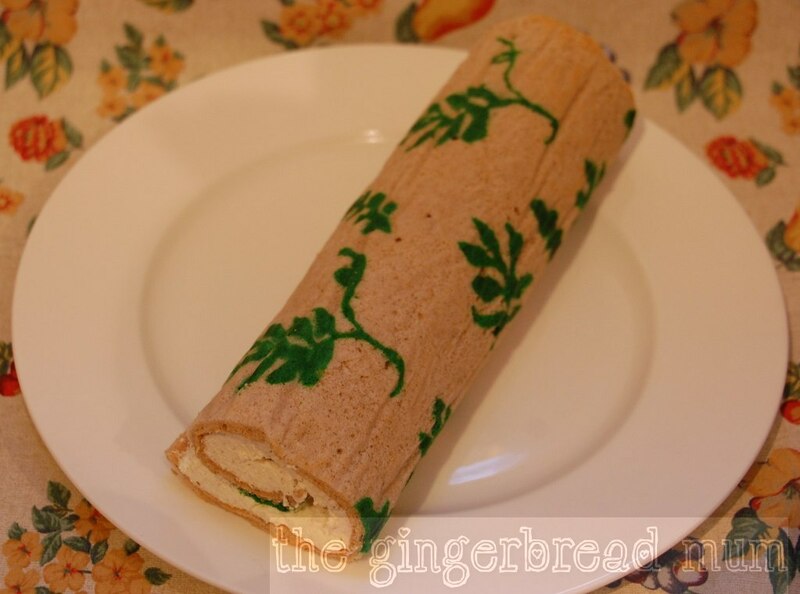 What pattern would you try on a Swiss roll? Something for a birthday or Christmas perhaps? To join in the Great Bloggers Bake Off or to see the other baking efforts, visit Mummy Mishaps. I’m also linking up with Supergolden Bake’s #CookBlogShare party. Posted in dessert, family, recipe, toddler and tagged #cookblogshare, #gbbo, bluebirdsunshine, Cupcakepedia, Great Bloggers Bake Off, Great British Bake Off, lemon myrtle, Mummy Mishaps, Supergolden bake, Swiss roll. Bookmark the permalink.